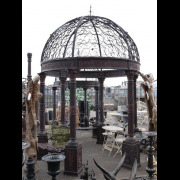 A fantastic Cast Iron Gazebo .This is in the temple form, with a decorative steel rotunda dome. This Gazebo Features six Corinthian columns, with surrounding seating. This is an ideal feature for any landscaped grounds within a hotel or large garden. A true focal point on a grand scale. Here at the Garden yard we offer a wonderful collection of garden furniture & ornaments, manufactured in genuine cast iron, steel, stone and other natural materials. Any of these well chosen pieces will enhance your property. Be it a Country Estate or Courtyard garden, they will excite comment wherever they are situated.